A convicted murderer from Teesside has been told he will die in prison after strangling and stabbing his wife. Douglas Vinter, 38, was separated from Anne White when he stabbed her to death at his mother's house in February. The bodybuilder, who was released from prison in 2005 after serving nine years for killing a workmate, later told police "I had my reasons". 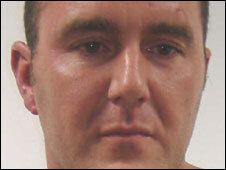 Vinter, of no fixed address, admitted murder and was given a whole life sentence at Teesside Crown Court. The court heard how he met Ms White while on prison leave, and the pair married in 2006. They separated seven months later, after Vinter twice beat her at their home in Eston. She was out with friends on 10 February when he bundled her into a car and took her to his mother's house in Normanby. Police found her body in the kitchen when Vinter, who used anabolic steroids and had been drinking and taking cocaine, handed himself into police the following morning. Ms White had been strangled and stabbed four times, and two knives - one of them broken in half - were found on the floor. The Recorder of Middlesbrough, Judge Peter Fox QC, said: "The extreme violence which you used is described as continuing, as far as can be seen. "You therefore fall into that small category of people who should be deprived permanently of their liberty. I therefore pass a whole life sentence." Vinter, formerly a railway signalman, was jailed in 1996 for the knife murder of train worker Robert Eden, 24, in a railway cabin.